I can't see anything wrong with your sprouts as far as colour. If you're referring to the blush of the beans, yours are a bit pinker than most I've seen but still normal. I've spen them ranging from an almost white tan to blush. Since I don't know whether you kept yours in utter darkness, so I can't say whether it's related to light levels. 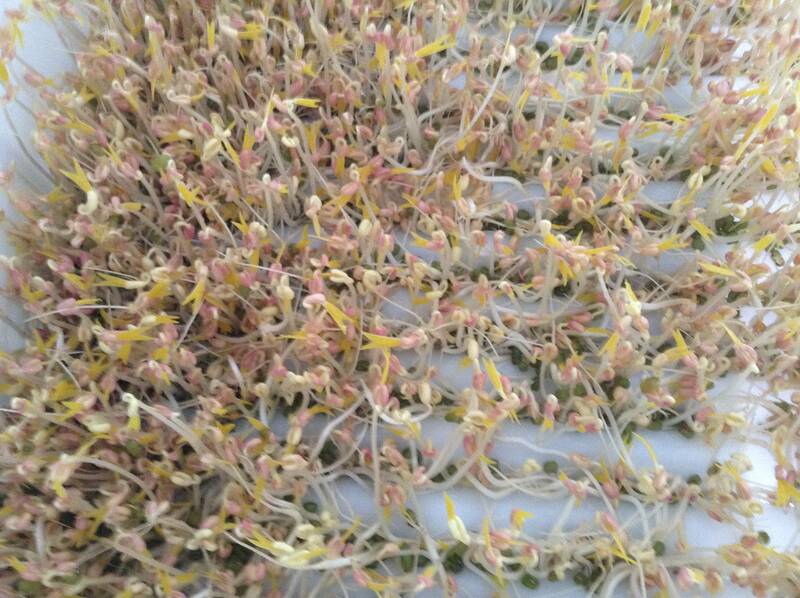 It's also possible that a number of different mung bean cultivars are used for sprouting (since the majority of food we eat has countless cultivars). If so, possibly different cultivars might show different variations in colour. I'm surprised that your sprouts are only 3 days old though. They already have developed leaves and that doesn't usually happen that quickly. Perhaps a little warmer than usual? That might even account for colour variations too. There's no harm eating them with developing leaves but they taste milder when the leaves just start peeking out for the two halves. I gave up sprouting mung beans as I never could figure a good way to get rid of most if the loose skins. Not the answer you're looking for? Browse other questions tagged storage-method storage-lifetime beans food-identification color or ask your own question.